Apparently Leroy and I are about to become tea connoisseurs. Given my love of coffee and indifference to its rival, this seems a little farfetched to me, but our guide Sunil assures me that it’s true. By the time we leave the Kolukkumalai Tea Estate today we’ll be experts, he said. Imagine the rough diamond outline of India and let your eyes travel down to the state of Kerala near the south-western tip. Kerala’s tropical coastline stretches 600 kilometres along the Arabian Sea and is famous for its palm-fringed beaches and backwaters. The port city of Kochi (also known as Cochin) lies about two-thirds of the way down the Malabar coast. Find Kochi on the map then head east, up into the densely forested Western Ghats to Munnar, a 19th century hill station and former resort built during the time of the British Raj. But don’t stop in Munnar. To catch up with us you’d then need to hire the services of a driver and a jeep and drive for almost two hours (38 kilometres) up through tea plantations, the road becoming progressively narrower, windy and bumpy as you approach Kolukkumalai near the border of Tamil Nadu state. Utilising one of the greatest perks of virtual travel, Leroy and I eschewed the need for a jeep — and associated motion sickness — and arrived only a few hundred metres away. We had a little explaining to do to Sunil about the absence of a driver or any discernible transport, but he seems to have accepted our story with good humour. Home to the highest tea plantations in the world, the hills of Kolukkumalai were lush and green under today’s cloudy skies. While not at all hot at this altitude (2400 metres above sea level), the air was syrupy with humidity and my hair quickly tripled in volume. I immediately lost all my energy and just wanted to lie in a hammock somewhere and gaze at the view, but Leroy slipped me a few chocolate covered coffee beans and convinced me that it would be weird and rude not to participate in Sunil’s tour of the processing facility. I’m so glad he did, because it was fascinating. 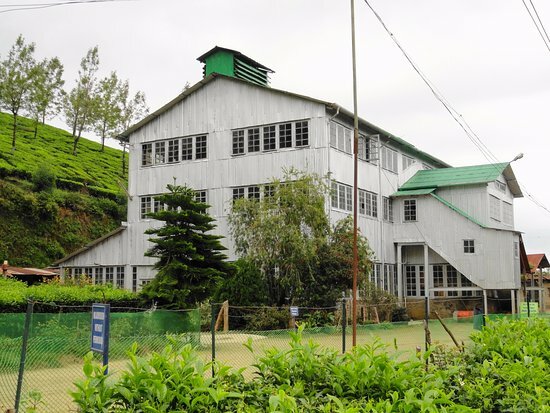 The old double-storey tea factory was built in the 1930s, and is completely evocative of another era with its timber interiors and pervasive scent of tea. The machines are old and robust and Sunil explained that, because of the state of the roads, it would be almost impossible to bring new machinery in. The tea itself is hand-harvested and processed by the orthodox method. The tea leaves are first partially dried (Sunil used the word ‘withered’) on a rack using a mixture of hot and cold air. Then they’re put through a rolling machine to break up the leaves to the size needed. These ground leaves are then left to oxidise during a fermentation phase, the leaves turning from green to a coppery colour and becoming more aromatic. 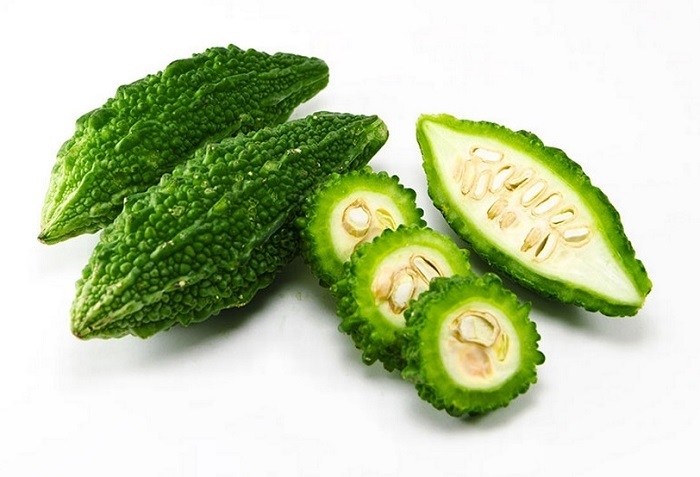 Once they’re deemed to have reached the perfect colour and scent, they’re dried, sieved, graded and packaged. Kolukkumalai teas are apparently known for their distinctive flavour and freshness due to the altitude they’re grown. After the tour Sunil left us at the tasting centre where, along with a handful of other intrepid tourists, we sampled the Broken Orange Pekoe and the Flowery Orange Pekoe. We learnt that the ‘orange’ in the name refers to the coppery colour of the tea as it oxidises and is nothing to do with the flavour. While not a convert, I do have a new-found appreciation for the beverage and the rituals around preparing and serving it. Leroy, almost as fond of tea as of coffee, bought almost a kilogram and spent quite a long time talking about how to get the best out of it back home. I have to admit, my thoughts drifted to other things while that was happening. Back at sea level, we went in search of lunch in Fort Kochi (Fort Cochin). The site of the first Portuguese walled citadel and a trading port for almost seven centuries, Fort Kochi is a fascinating mix of cultures: spice markets, a 16th century synagogue, Hindu temples, Chinese fishing nets, a Portuguese palace and 17th century Dutch houses all in close proximity. 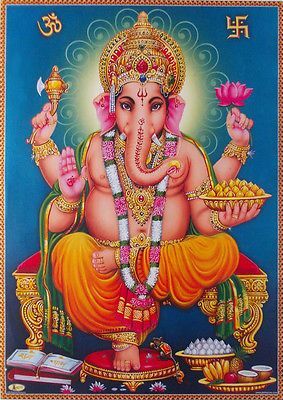 Leroy took a fancy to a small family-run restaurant near the water and encrusted with posters and paintings of Ganesh. We ate our fill of a range of coconut-based curries, beautifully flavoured with locally grown and highly aromatic cinnamon, cardamon, chilli, cloves, black pepper and ginger. Leroy had chicken and prawns, but as usual I veered more towards the vegetarian options, sampling bitter gourd for the first time, along with plantains, taro and yams. Coconut and rice are big here — not surprising in the tropics. We’re now off to explore Fort Kochi for a few hours. 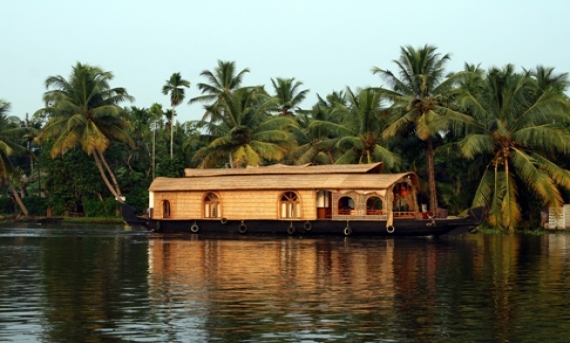 We’ve also decided to extend our virtual trip another day and head south to Alappuzha (also known as Alleppey), the best place to find a boat or even a canoe that will take us deep into the serene Kerala backwaters.